CurricUNET META (aka META) is our online curriculum management system and new home for all of our Assessment of Student Learning. 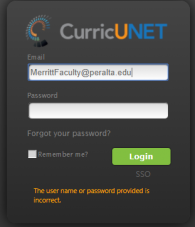 CurricUNET META is a web-based curriculum management system for the development, review, and approval of academic courses and programs. It provides a searchable database of Merritt’s entire curriculum inventory for both the college community and the general public. Supported web browsers include Apple Safari, Google Chrome, Microsoft Edge, and Mozilla Firefox. CurricUNET META is not currently optimized for mobile devices such as tablets and smart phones. Click on Link for Step by step instructions! Click on the CuricUNET image to be redirected to the META home page. User name is your full Peralta email address. Password is the same password you used for the old CurricuNET system. If you do not remember your password: Click on “Forgot Password” to reset it. See our Assessment Contacts & SLOAC Membership page to find the coordinator to contact for your instructional division or service area.